Artist's impression of a supernova explosion. Credit: European Southern Observatory/M. Kornmesser. It's the celestial equivalent of a horror movie villain—a star that wouldn't stay dead. An international team of astronomers including Carnegie's Nick Konidaris and Benjamin Shappee discovered a star that exploded multiple times over a period of 50 years. The finding, published by Nature, completely confounds existing knowledge of a star's end of life, and Konidaris' instrument-construction played a crucial role in analyzing the phenomenon. This analysis indicated that the explosion was what's called a type II-P supernova, and everything about the discovery seemed normal. Until, that is, a few months later when the supernova started getting brighter again. Type II-P supernovae usually remain bright for about 100 days. But iPTF14hls remained bright for more than 600! What's more, archival data revealed a 1954 explosion in the exact same location. 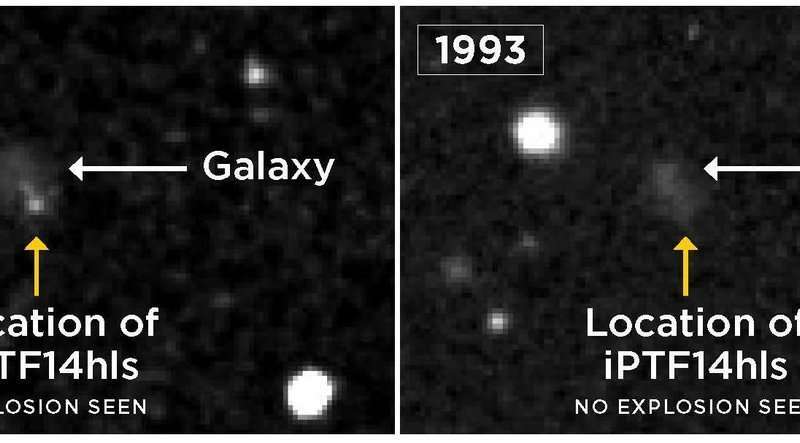 An image taken by the Palomar Observatory Sky Survey reveals a possible explosion in the year 1954 at the location of iPTF14hls (left), not seen in a later image taken in 1993 (right). Supernovae are known to explode only once, shine for a few months and then fade, but iPTF14hls experienced at least two explosions, 60 years apart. Credit: Adapted from Arcavi et al. 2017, Nature. POSS/DSS/LCO/S. Wilkinson. "This supernova breaks everything we thought we knew about how they work," said lead author Iair Arcavi of University of California Santa Barbara and Las Cumbres Observatory. Called the SED Machine, Konidaris' tool is able to rapidly classify supernovae and other short-lived astronomical events. A quick turnaround on classifying these kinds of so-called transient objects in the sky was sorely needed when Konidaris and former colleagues at Caltech first built the machine. iPTF14hls grew bright and dim again at least five times over two years. This behavior has never been seen in previous supernovae, which typically remain bright for approximately 100 days and then fade. Credit: Adapted from Arcavi et al. 2017, Nature. LCO/S. Wilkinson. "But not too long ago it was faster to identify short-lived celestial phenomena than it was to classify them and determine what they could teach us," Konidaris said. "Which is why we built SED, but I never expected it would help us analyze an explosion as strange as this zombie star." "Nick's role in this discovery demonstrates the importance of having an active instrumentation effort, which is increasingly rare on many campuses," added Observatories Director John Mulchaey. Re: "This supernova breaks everything we thought we knew about how they work"
A rational response would be to question the theory, its assumptions, or the original hypothesis. Or the data. How do they know it's the same star and not a different one? Confirmational bias (or researcher's bias), IMO, is the root cause in many of these dilemmas. The stellar evolution theory is proposed because it supports many observations at that time. Perfect. But when conflicting evidence emerges, the underlying theory is merely adjusted, which is fine. Then the theory is 'confirmed' again and again until another event like what we have here is observed. Too much credence is given to 'confirmations' even when an unlimited number of hypotheses could produce the same predictions. In those cases, Occam's razor points us to the hypothesis with the least number of assumptions. Clearly, with all of the dark matter, dark energy, gravitational waves, etc. that we "know" must be there and constitutes the foundation of standard cosmology, modern astrophysical scientists have told Occam to shove it. modern astrophysical scientists have told Occam to shove it. But not really because you missed out an important bit, Occam's razor is only a guiding principle in the case where models exist with equal explanatory power ("other things being equal"). You may believe the standard cosmological model is too complicated but show me a simpler one that can fit the cosmic microwave background powerspectrum and the BAO data. As it happens science has gone beyond Occam's razor, which is a nice idea but doesn't actually detail what simplicity means or when it should be traded for a model which fits the data better. In science there is Bayesian statistics which quantifies what it means to be a simpler model in terms of parameters spaces. Far from being "told to shove it" Bayesian logic is a flourishing industry in astronomy. Yes, I understand that Occam's razor is not some golden rule which works flawlessly in all situations. However, in your modest example of asking to provide a simpler view of cosmology that fits the cosmic microwave background already makes assumptions about the interpretations of that data. It's not that the current model is "too complicated" and therefore inaccurate. My issue is the reluctance to alter the current dogma in the face of conflicting evidence. I am most incredulous of the dark matter postulation. A lot of incredibly smart astrophysicists had a model for the way the universe worked. Astronomers directly observe the rotation of galaxies to defy the paradigm of that time, and in more ways than one. This becomes interpreted as an indirect observation of dark matter, which 'must' be there for the galaxy to sustain and 'must' be in very particular places, evidenced by the flat rotation curve... only to keep the prevailing idea afloat. Does this really not bother you? Citing the Razor is a rhetorical gimmick. It works in high school debates, where scientific rigor is lacking among both contestants and judges. It doesn't work for actual science. Simplicity is desired by scientists, make no mistake about that. But scientists know that the simple answer isn't always the right one. Instead of simplicity, scientists look for best-fit explanations for available data. As more data is acquired, the best-fit explanation might have to change; that, too, is part of how science proceeds. Where two explanations are equal in explaining data, scientists will *prefer* the simpler one. But Occam's Razor is not used to annoint an explanation with science's blessing. So long as available data fails to rule out an explanation, it remains in play and is a valid target for research. correct...theories have to be thrown out...not manipulated to fit a narrative! in your modest example of asking to provide a simpler view of cosmology that fits the cosmic microwave background already makes assumptions about the interpretations of that data. But it doesn't, data is data. Measuring the angular powerspecturm of the CMB doesn't depend on cosmology because it's in angles on the sky and thus just an observed quantity. Only if you choose to give a false account of history. You neglect the fact of course this wasn't the only attempt at solving the rotation curve problem, it was however the most successful one. Dark matter was hypotheses to solve the problem, it wasn't asserted. It's strength among rivals like MOND is that it didn't just fit the data, it explained why rotation curves were flat from simple principles. It was shown in the late 80's it was shown based on gravity and initial conditions taken from the CMB that the simplest dark matter forms halos which flatten rotation curves. Then further work was done, independently measuring masses of galaxies and clusters via gravitational lensing which gave further strength to this hypothesis. Then it correctly predicted the powerspectrum of the CMB... And so on. A relativistic electron beam that does not produce microwave radiation is unknown. You'll of course note I asked for a fit to the powerspectrum, not and obvious and irrelevant point. Explaining the presence of microwaves in space is not hard, explaining the powerspectrum (the distribution of fluctuations on the sky as a function of scale) is however quite hard and has never been attempted in plasma cosmology. 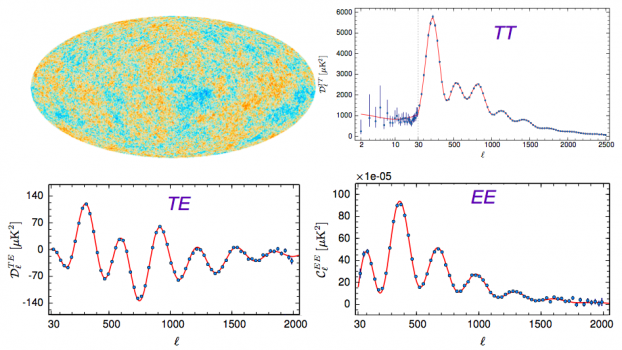 To make matters worse Alfven's model of the CMB is quite dead, the observation of the SZ effect shows that indeed galaxy clusters leave imprints on the CMB. The feeling is entirely understandable, rossim. But you are really asking too much when you expect an entire model --and one which works very well-- to be scrapped on the basis of one putative inconsistency. I say "putative" because it is exactly that, and what it actually is remains to be seen and confirmed. There also exists the possibility that this supposed star is the one-in-a-gazillion that is poised at the vanishingly thin edge of a possibility to exhibit this behavior within the parameters, made possible by some apparently so insignificant variable that hasn't yet been included in the calculations. One thing is undeniably certain, however, and that is that we missed quite a bit --if not all-- of the circumstances which led to these observations. May I suggest a cosmological equivalent? However, you are wasting your effort doing so, CR. I will make the counter-suggesstion that the cosmos is not now, nor will it ever be in anything like a state directly comparable to the ionosphere of our planet, much less a charge-loaded metal sphere. Your intergalactic plasma double-layers exist in a medium that is expanding omnidirectionally and continually. Just think, for a moment, what that means in terms of charge density, or even plasma, itself, double-layer or no. The Electric Universe Speculation can best be likened to an enameled steel --or even earthenware-- chamber pot, and its contents. But you are really asking too much when you expect an entire model --and one which works very well-- to be scrapped on the basis of one putative inconsistency. That's quite comical to suggest the standard "theory" only suffers from a single "putative inconsistency". Consider for only for a second the missing 96% of the Universe of the standard guess. It's not at all ironic chamberpots are full of dark matter. So now you claim that the Electric Universe Speculation is, in fact, really just another description of Dark Matter? Really --you EU evangelists wouln't know the difference between your heads and holes in the ground, or chamberpots-- even if your heads were stuck in them. Question for you, candide-- is the phrase "Too Clever By Half" ironic? I bet astronomers half-expect this to happen anyway, multiple supernova is probably not impossible to happen in their mind, for example; in Type Ia supernova there is 2 explosion happening in sequence on same star: one was from the gas fusing on the surface of a Neutron star (the gas came from its companion star in Binary configuration), second is the explosion from the fusion of core material induced from the shockwave of the first explosion. Both would look similar to us anyway, at least if you ignore the detail; there's bright flash and there will be a lot of ejected material. I expect if somekind of a special star can survive multiple supernova explosion then it could explode again and again until its food source is gone. There's even report that say some Neutron star survive a Type Ia supernova (the explosion was imperfect and it didn't rip the star apart) and it flew into space like a cannonball. What I'm trying to say is: I don't think thermonuclear explosion on a strange new star need to always be stable & banal like our sun, instead you expect chaos and randomness that allow something like recurring supernova to become possible on a star. I find it fascinating that not only did this star explode more than once, the supernova brightness at max was an order of magnitude greater than a normal one. 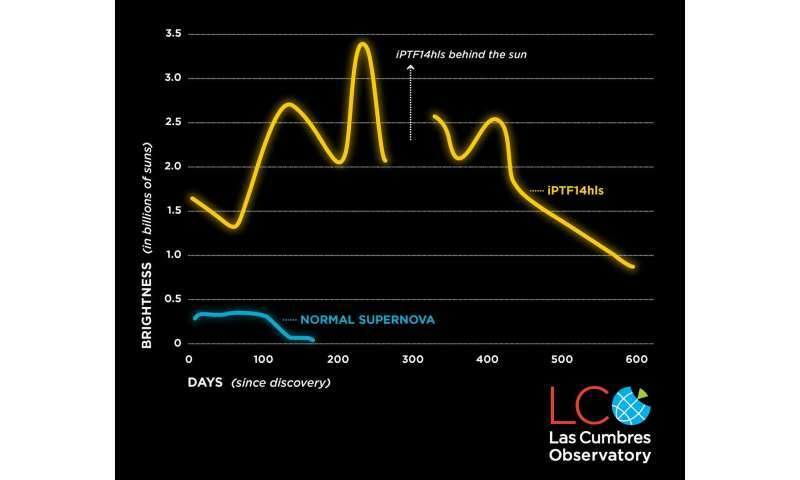 I wonder if anyone can get a light curve from the previous explosion. #x, are you're thinking the companion was a flare-star of some form ? So we're seeing a 'recurring mega-nova' event before the core finally blows ?? Go to the page where Peratt mentions this and look at the power spectrum. The CMB is that little tiny smooth hump at the top. You may but it's nothing more than a handwave, it offers no means to be compared to observations. I asked specifically for a model to fit the powerspectrum as an example, quantitative science. The electric universe crowd love to claim their model is so much simpler but without actually providing models that can fit things like the CMB powerspectum that is an empty assertion. Simplicity isn't objective without quantitative science. Please explain how I am supposed to the creation of the universe in the graphs you linked to. As usual you go for the basic strawman. Without actually showing the model is viable you haven't demonstrated anything. That means showing it's consistent with the data, in the case if the CMB that means fitting the powerspectrum among other data. What you put forward was a handwave, nothing more. Random assertions may be good enough to pass into the dogma of the electric universe but that's not the case in science. Consider a blue supergiant in close orbit around a white dwarf. 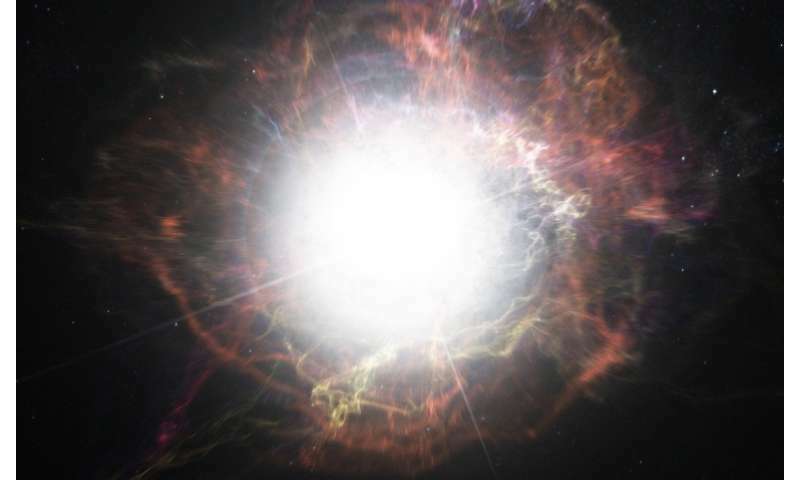 The supergiant explodes as a Type II supernova producing an enormous outflow of gas, which accumulates onto the white dwarf over a period of 50 years. At which point the white dwarf explodes as a Type I supernova. Considering that these types of systems produce most Type 1 supernova, and the short lifetimes of supergiants, it is only a matter of time until we see a system where the supergiant goes supernova first. Imagine how rich a gaseous environment would exist around a companion white dwarf after its parent exploded. Indeed, it is interesting to postulate the situation in which a white dwarf is close to critical mass from absorption, and when the supergiant companion explodes the white dwarf absorbs enough material to go at the same time. I wonder what the signature of that would look like? Note: I know that most Type 1's are caused by white dwarfs orbiting ordinary stars. Scripture dressed up in equations is still scripture. "As far as I can see, such a theory remains entirely outside any metaphysical or religious question"
The glaring inconsistency in Alfven's claim is that Lemaître proposed there was a "primordial atom", not nothing, it makes no sense. And Alfven was clear by saying Lemaître made these claims in private. He assuredly would never make these claims known publicly as being a scientists on the side he would be dismissed by the scientific community by saying such a thing. But I'm sure you will just claim Alfvén was lying, besides Catholic priests never lie. To be absolutely clear on the matter, Wal Thornhill is not a fan of religion, and David Talbott's explanation of mythology forcefully undermines traditional religious notions. It is irrelevant what those two non-scientists believe. They are followers of the non-scientist Velikovsky, who has been thoroughly debunked for decades. By definition, anybody that follows him is sure as hell not doing science, and is therefore irrelevant in any scientific context. These are today merely historical footnotes for the EU. By contrast, the creation of the universe from nothing is a religious doctrine which the Big Bang has built an entire theoretical structure upon. Hardly, but nice of you to exhibit this conflation, and thereby make it(and, one supposes, the remaining content of your "mind") so easy to ridicule. But we'll set all that delicious entertainment aside for a while, as there is bigger game afoot. Now --please do tell us how the EU "Theorists" propose the Universe to have come into existence, won't you? I don't think we have the angular resolution to be certain that this is the same star and not two nearby SNe. This may be the more parsimonious hypothesis. Militating against it is the multiple light curves. DS, interesting info. If there are three SNe type stars in close proximity to one another. How could we differentiate between them with present technology? To continue your unasked question. An explosion was sighted from one of those three stars. Perhaps it was the same star that exploded before. Perhaps not. However, even if the researchers are wrong about which star they detected? Still, one of those three stars did explode recently. Perhaps it was the star that exploded previously. Perhaps the SNe stars (or at least a sub-category) are cyclic. For a period of time, exploding when enough extraneous material accumulates? They have made it clear they are not interested in such metaphysical conjecture, besides the Plasma Cosmology in which the EU agrees is a steady state model. They'll leave the creation theories to religions such as Christianity and the big bang beliefs. P.S. Just a wild hunch. The recent chatter about our Sun intermingling the cometary slushies of it's Oort Cloud with other close passing stars. Wouldn't that reasoning apply to this situation even better? One of the three fraternizing SNe stars explodes. The mass of expletives gets captured and falls in upon the other two stars? In turn triggering those off to explode? A pattern of swapping star snot back and forth? This idea could even be predictive. Considering the distance between the three stars and the speed of the expelled matter. Some clever astronomer could make a reasonable guesstimate as to when one of the target stars would be set off? Yes, you are exactly right, candide. Your EUMORONS can't be bothered to develop a self-consistent physics which relates the PAST to the PRESENT, as one thing is said to lead to another. May just as well try to explain a pot of boiling water --minus the apparatus required to heat it-- as to fully constrain EUMORON "theory". You're right Taliban, we'll let you and religious types like yourself work out the creation theories. EU is perfectly consistent with the steady state Universe. cd8, you may want to reconsider your argument. Cause a Steady State Universe is the pseudo-scientific rationalization plagiarized from the theological apologia for an eternal, infinite deity being omniscient and omnipotent. Candide, It is not enough for you and the EUMORON tribe to simply declare that "the sky is blue". That's not Science. For it to be Science it must be demonstrated not only that it is so, but also how it came to be so. A "Steady State" satisfies only one(partially) of these conditions. You can run on, but you canthide85. The unproven claim that the sky is cerulean is not the worst drivel from the stuporious cult of corybantics. That honor would have to go their witless claims that the color of the sky is determined and by some giant faerie in the sky. Ohhh, look in the sky! A fluffy cloud resembling sheeple in a church... It must be magic! The sky radiates at the color temperature of 2.725 K. Its color is microwave at 160 GHz, well below the infrared and far below the ability of the human eye to detect. Just for reference the color temperature of the blue sky is 5,700 K. That's the temperature of the solar surface minus the wavelengths the Earth's atmosphere takes out. It's pretty close to a couple thousand degrees hotter than the cosmic microwave background. You might make some deductions based on that if you were to notice that the night sky is black.